Although I have wanted to visit Badlands National Park for many years, it was actually Custer State Park that most delighted me during a much-too-short visit to South Dakota with my husband earlier this week. That’s not to say I was disappointed in Badlands; it's just to point out the uniqueness of Custer State Park. At more than 71,000 acres, it is among the largest state parks in the country and easily rivals many national parks in beauty and wildlife viewing opportunities. Located in the Black Hills, it is just a stone’s throw from Mount Rushmore National Memorial, the Crazy Horse Memorial, Wind Cave National Parkand many other destinations. Four primary roads provide access to the park. The most popular is the Wildlife Loop Road (18 miles), which winds through lush, rolling hills with excellent wildlife viewing opportunities. We saw prairie dogs, pronghorns, deer, coyote, bighorn sheep and a herd of buffalo. (Not to mention the “wild” burros that poke their heads in tourists' cars looking for food.) If we had been there during prime viewing hours (closer to dawn and dusk), we may have also seen elk and mountain goats. Iron Mountain Road (18 miles) is a narrow, winding road that features one-lane tunnels chiseled through stone, sharp switchbacks, a series of pigtail-loop bridges and stunning views of Mount Rushmore (including one perfectly framed by a tunnel). Needles Highway (14 miles) offers a spectacular drive through a spruce and pine forest, and alongside spires and domes of granite. 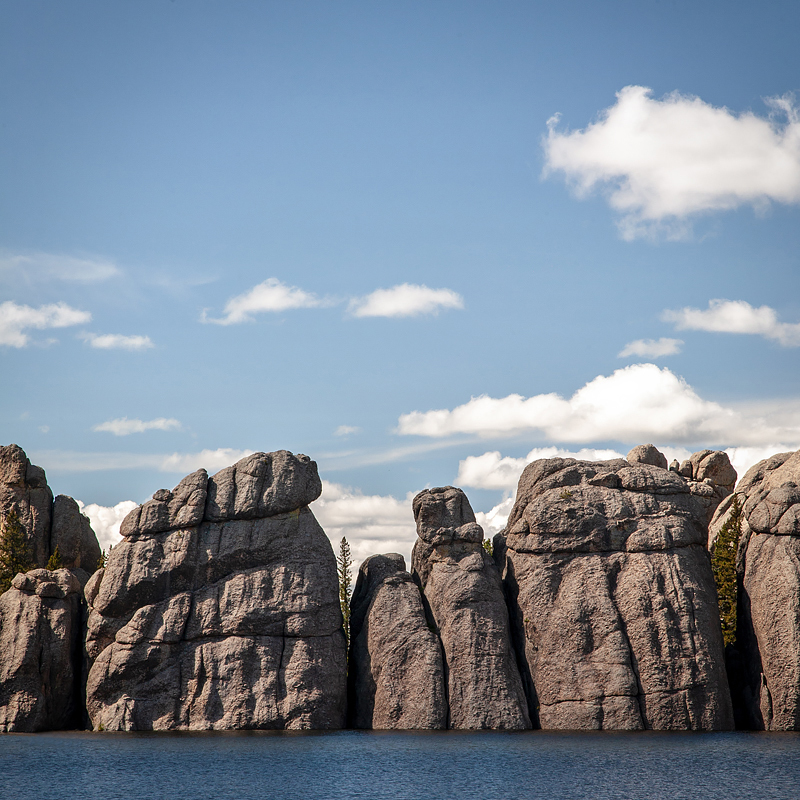 We drove through a narrow, stone passageway just wide enough for a single car and stopped for a while at Sylvan Lake, set against a backdrop of granite boulders rising up out of the water. The Peter Norbeck Scenic Byway bisects the park and connects the scenic drives. Sections of the park burned last December in the Legion Lake Fire, but are recovering nicely. If anything, the red, singed branches of ponderosa pines are striking against a new flush of green grass (it has that complementary color thing going for it) and it is fascinating to see the regeneration process. Dead timber is being cleared in some areas of the park, which should help prevent further forest fires. The diversity of scenery and wildlife in Custer State Park is a photographer’s dream. I’d love to go back and spend a week in the park, staying in one of the lodges or cabins. This would make it much easier to explore the park photographically and to be in the right place for sunrise and sunset. I'd also like to rent one of those kayaks on Sylvan Lake for a closer look at those boulders (though I'm not sure I want to dip more than a toe or two into the chilly water). I was also pleasantly surprised by Rapid City, just an hour away from the park. It is a wonderful small city with the historic Hotel Alex Johnson, excellent restaurants, art galleries and unique shops. My favorite was Prairie Edge—a combination Sioux trading post, antique store, regional bookstore, art gallery, Pendleton shop and more. Tucked away on the top floor was a bead library—a collection of thousands of beautifully displayed jars filled with colorful beads used by Native Americans to decorate their ceremonial clothing and accessories. Have you visited a new place recently? What were your first impressions? What did you discover when you dug a little deeper? How might you photograph it if you were to return? The Legion Lake Fire scorched trees, shrubs and ground covers last December. Already, the grasses are bouncing back in a process of regeneration. Boulders rise up from Sylvan Lake toward the north end of the Needles Highway.